This chapter argues that for women, the end of a relationship can be likely to indicate a ‘turning point’ for desistance, and that there may be a link between desistance and coercive control and other forms of domestic abuse. Additionally, employment is not a panacea for female desistance. The feminisation of poverty is considered, particularly in the context of austerity measures which disproportionately affect women. Yet women are often encouraged into ‘hyper-moral’ (Matthews et al. Exiting Prostitution. 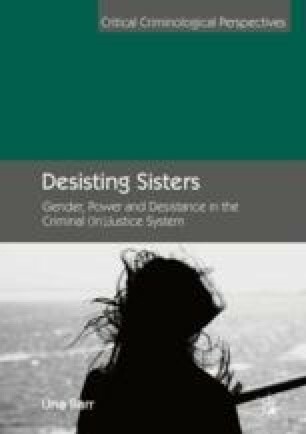 New York: Palgrave Macmillan, 2014) roles following criminal justice contact including volunteering, arguably as a result of their status both as transgressors of the law and as women, which is clearly problematic in that these roles are, by their definition, unpaid. This focus on marriage and employment in social bonds theories will be argued here to be negligent of the structural conditions of female desistance. If we are to rehabilitate female offenders, we must take proper account of the realities of their lives and ensure that resources are best targeted to help more women turn their lives around. Inquest.org.uk. (2018). Deaths of Women in Prison|INQUEST. [online] Available at: http://inquest.org.uk/statistics/deaths-of-women-in-prison. Accessed 27 Dec 2018. Richards, G. (2018). What It’s Like Growing Up as a Working-class Girl in the UK. The Conversation. Available at: https://theconversation.com/what-its-like-growing-up-as-a-working-class-girl-in-the-uk-93403. Accessed 27 Dec 2018. Women’s Budget Group. (2016). Rethinking Austerity Is Overdue: It Has Hit Women and Ethnic Minorities Hardest. Available at: https://wbg.org.uk/media/rethinking-austerity-overdue-hit-women-ethnic-minorities-hardest/. Accessed 27 Dec 2018.